Alice's adventures in... Bahrain #4 - RACE DAY! 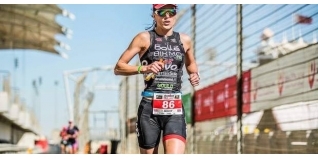 So far we've heard 'Alice get lost', 'Alice makes friends' and 'Alice get ready'... so, how did race day at Ironman 70.3 Bahrain go for British Pro, Alice Hector (www.alicetri.com)? Well, you can now read 'Alice does well'! Alice Does Well in Bahrain - 7th. Seventh - I'll take that in a championship race in winter! With pay cheques for the top-10 (and I believe every one of the top 10 has won an Ironman event before), it was very competitive. Every minute a pro woman ran through the finish chute at the end, so it was a relatively tight affair (as I thought it might be). Whilst perhaps not every second counted, you certainly couldn't afford a mechanical or a sugar crash (or more than one 'restroom visit'). The race was on, and it was good to be a part of an event where you weren't 'flying solo' the whole way. Hopefully pro women's racing will now continue this momentum with its raise in depth and quality. So to the action. The swim was choppier than it looked. The age group swim was shortened, and we wondered why as it looked just fine, but in there it was turbulent with weird currents going on - kind of fun but physically pretty demanding. I slotted into a pack and simply followed the crowd. I was a bit sluggish on the bike to start with but revved the old engine up eventually - the winds were high and I had to keep my wits about me but I didn't fall off (unlike the Prince of Bahrain, who fell off his beautiful bicycle at the first corner, ending his race there). Onto the run, and after going through the first 10k in around 38 minutes feeling great, I started to fade a bit, but the girls were coming for me, so it was a case of forcing it all out in the last 5k! The commentator, Paul Kaye, called me down the finish chute as a "full time triathlete and part time model" as I wobbled in, smeared with grime and looking like something the cat dragged in. I won't hold my breath on an influx of casting calls based on that promotion. But thanks anyway, Paul! To summarise; I was a bit rusty around the edges but hey, it's December, and now I get to eat chocolate and drink wine for two weeks and realising that is perhaps the best part of my day! A highlight of the event for me was seeing Emma Pallant nearly stealing the entire show and finishing in second place, after leading for most of the run. It won't be long before she's dominating these events: a true talent and a lovely person! Beware of the split transition. It takes more time and energy in the days preceding. There is good transport to and from both venues. It can be very windy: pack a deep section front wheel only if you're very confident in gusty conditions. Great course: it takes in the Formula 1 race track on the bike and a lovely safari park run. Temperature: 18-20 degrees - perfect for coming from the UK winter!